Most everyone has heard the story of David and Goliath, but of course, as we ministers like to say, “It bears repeating.” It is the story where King Saul and the Israelites are in battle with the Philistines. Twice a day for forty days, Goliath, the champion of the Philistines, comes out and challenges the Israelites to send out a champion of their own to decide the outcome of the battle. King Saul and all the other Israelites are afraid of Goliath. David comes to the battle to bring food for his brothers and obtain a report for his father. David hears about Goliath and the promised reward King Saul has offered to whoever defeats Goliath. David accepts the challenge after convincing King Saul to let him face Goliath. David, for all intents and purposes, is no match for Goliath. Goliath is nearly ten feet tall and an experienced soldier. He is, after all, the Philistines “champion!” However, David knows “whose he is” and for that matter, “whose” Goliath is not. David faces this giant based on his covenant with Almighty God. David knows that he has God on his side. David is in relationship with God and he remembers all that God has done for him previously. King Saul offers David his armor, but David goes with a sling-shot instead! David defeats Goliath with the slinging of one rock. Of course, Goliath dies by the power of God behind that rock! David faces and defeats his giant. He kills Goliath, cuts off his head and feeds his body to the wild animals! No more twice-a-day taunting by that no-covenant-having devil! 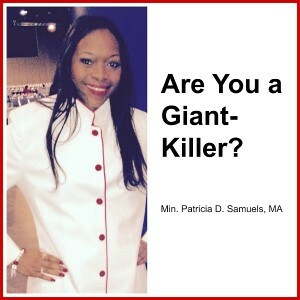 Are you a Giant-Killer? Or do you run and hide every time the giants taunt you? I encourage you to be like David. Face your giant and then kill your giant by the power of Almighty God. Don’t go in your own strength. In your own strength, you’ll be “giant-food.” However, in the power of Almighty God, you can defeat your giants! I have a feeling you’re a giant killer! Thank you sister Patricia,for this. I also have been on both sides. But i thank God for helping me to be on just one side; the giant killing side.